Less than one month after announcing his return to professional basketball overseas, Lamar Odom (6'10''-F-79, college: Rhode Island) has reportedly agreed to join Ice Cube's Big3 League. Odom, 39, will be featured in the 2019 Big3 draft pool. "He's worked hard and we're thrilled to see him return to US professional basketball at the #BIG3Season3 combine," the league said Thursday. 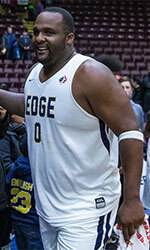 Odom recently returned to pro basketball at The Dubai International Basketball Championship on February 1. 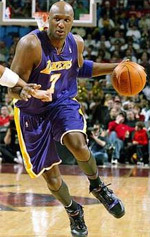 He has not played in the NBA since the 2012-13 season when he was a member of the Los Angeles Clippers. The two-time NBA champion, and Sixth Man of the Year Award winner in 2010-11, averaged 13.3 points, 8.4 rebounds and 3.7 assists per game during the course of his career. Last year, Odom revealed that he suffered12 strokes and six heart attacks while in a coma following his 2015 overdose at Dennis Hof's Love Ranch South in Pahrump, Nevada. During a sit down interview on Kevin Hart's Youtube talk show series "Cold As Balls," L.O. old told Hart, "All my doctors that see me say I'm a walking miracle."